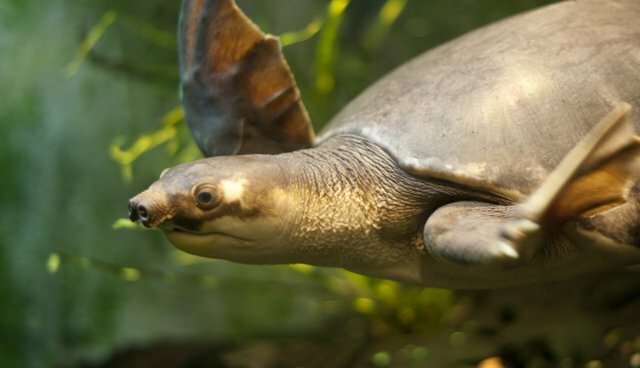 The pig-nosed turtle is a wonderful evolutionary mash-up: a fleshy snout with porcine nostrils, a soft shell and, unusual for a freshwater turtle, long webbed flippers. But the turtles' unique characteristics means, unfortunately, these vulnerable reptiles have found themselves in the crosshairs of the illegal international wildlife trade. A pig-nosed turtle may seem cute, but demand for pet turtles and folk medicine is driving down their population in places like Papua, Indonesia. Wildlife trade monitoring group TRAFFIC reports that local residents collect as many as 2 million wild turtle eggs each year - illegally - and then sell the hatchlings, as the turtles are difficult to breed in captivity. Traditionally, pig-nosed turtles were a food supply to these groups, but, according to TRAFFIC, wildlife traders have begun offering monetary rewards in exchange for juvenile turtles. Pig-nosed turtles have only left Indonesia legally once, with 57 turtles destined for the U.S. in 2006, TRAFFIC reports. It's much cheaper to attempt to smuggle the turtles across international borders. In the previous decade, busts have recaptured 80,000 turtles, with a staggering 12,247 reptiles found in a single seizure. The turtles, often juveniles kept in suitcases, perish at a rate of about one in five during transit. In 2011, Australian biologist Carla Eisemberg at the University of Canberra called for the establishment of local programs that encourage the protection of these turtles while respecting the needs of human populations to collect food.